This Feiss Merrill 2 light flush outdoor porch lantern in heritage bronze finish is rated IP44 and features Art Deco style and etched glass. Boasting circular flush mount and etched cream glass shade, with outer bars, lower ring and bottom finial. The etched cream glass gives a wonderful glow to any porch. This collection features many attributes found in the classic lanterns of the 1920’s and 30’s. Modern geometric forms and soft heritage bronze finish with cream etched glass creates a versatile look that’s at home in both modern and traditional architectural styles. If you are searching for quality outdoor lighting in Art Deco style, the Merrill suite should be considered. Fully weatherproof and supplied with a manufacturer’s 3-year anti corrosion warranty, which relates to the corrosion of finishes on outside lights like this one. Locations within 5 miles of the coast are excluded. There are matching fittings available in the Merrill outdoor lighting collection; please see below. This exterior light is supplied by Elstead Lighting and designed in the USA by Hinkley, founded in 1922 in Cleveland, Ohio. 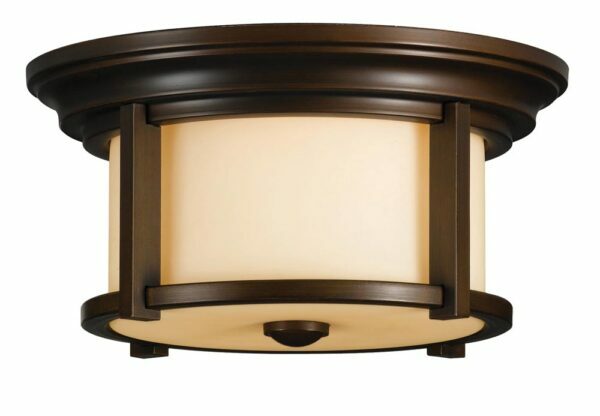 They have transformed from a small outdoor lantern company to a global brand intent on bringing you the best in style, quality and value designs like the Merrill 2 light flush outdoor porch lantern in heritage bronze finish and rated IP44 featured here.